Are you interested in becoming a Bravo Buddy? Bravo Buddies summer music camp, which happens every year in June and July, provides 45 minutes of private music lessons two times a week for elementary and middle school students of all skill levels. 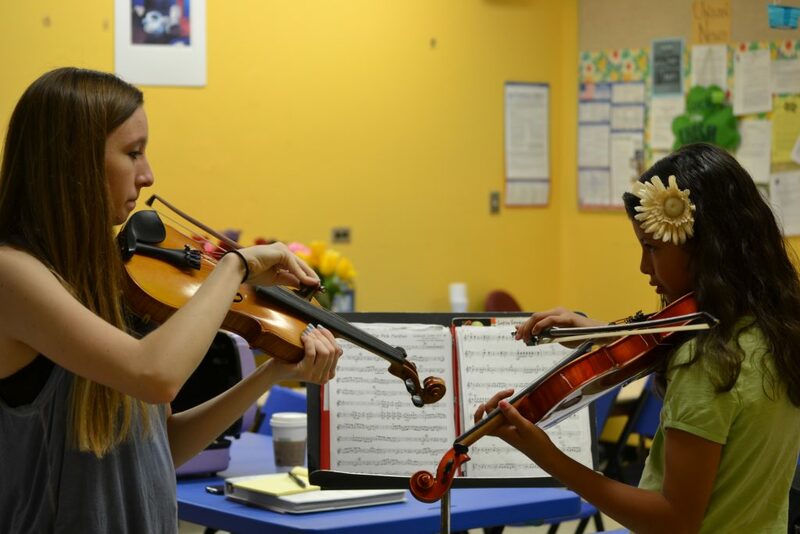 Most of our campers have never had individual music instruction — this program provides that necessary experience and allows them to continue their musical progress over the summer. Field trips, camp-wide workshops and professional music performances are part of our camp curriculum. Camp is staffed by talented college music education majors and top orchestra, band and voice students from surrounding North Shore high schools. Bravo Buddies is a win-win for students and their teachers. Students benefit from private lessons and teachers learn by sharing their knowledge and experience. Bravo underwrites 90% of the cost of tuition — making the program very affordable and accessible. Students in need are given scholarships. "Thank you so much for hiring and selecting such wonderful mentors for Scarlett and Patrick. Evan truly challenged Scarlett in a way that forced her to be on top of her game. His is a very cerebral and creative young man and was a terrific mentor for her. Lizzie could not have been any better for Patrick. I had said Patrick needed an expressive teacher… she is smart, warm and skilled. We loved them both! I can’t thank you enough for continuing to develop Bravo Buddies into such a superb summer program." "Teaching for Bravo has been nothing short of an enlightening experience. Over the past six years, I have seen the program grow and students develop their passion for music. It has really shown me the tremendous power of music to brighten students’ lives. What is most inspiring to me is to see the growth that each student undergoes over the course of four short weeks. Bravo Waukegan and the Bravo Buddies program has fostered beautiful relationships and made lasting connections between me, my students, and the music we create together."